Number's drawn: 11, 15, 17 and 22. Jackpot of £1100 won by Seamus Kidd, Coolshinney. Next weeks jackpot is £300. 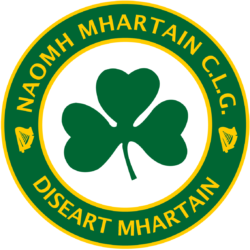 Desertmartin V Doire Colmcille on Monday 6th May in Owenbeg at 11.45. The winner of "guess the score" in Derry V Kerry was Jimmy Johnston, Ballymaguigan. Please note Derry V Monaghan Champioship Game and also the offical opening of Celtic Parks new stand is all ticket. All request for tickets must be forwarded to the Treasurer Veronica Smith (79631547) or Chairman Pat Kidd(07718257555) no later than Monday night 4th May. The Irish Language Collection will be taken up at all Masses this weekend. Don't forget TG4 star Justin McGurk is appearing in the Gaelic Centre on Friday 15th May. All tickets purchased for original show date are still valid. As you know, 10th May has been set aside as Lá na gClub as part of our 125 celebrations. The day will commence with a parade of underage and adult players led by Sarsfields Accordion Band from the chapel after 11.30pm mass. All members must wear the club jersey. Also a game of Married Men V Single men. There will also be an introduction of the 1953 County Senior Champions and also the 1968 Junior County Champions. Traditional Music and Irish Dancing will also be part of the celebrations as well as a Barbecue and side shows etc. A program of all the events and times will be available prior to the event.